Follow Airport Way then merge onto I-205 South. Take exit 21B to merge onto I-84 West/US 30 toward Portland. Take the exit left toward Salem, and merge onto I-5 South. Follow I-5 South for 6 miles then take exit 294 for OR-99W toward Tigard/Newberg. Follow 99W through Tigard, Sherwood, Newberg and Dundee. Continue on 99W for 4 miles, then turn left onto OR-18 toward McMinnville. Follow OR-18 for 6 miles. Take the exit for McMinnville and follow for approximately 0.5 miles. Turn right on NE Irvine St. The winery is at the corner of Irvine and 4th Street. Follow OR-18 for 6 miles. 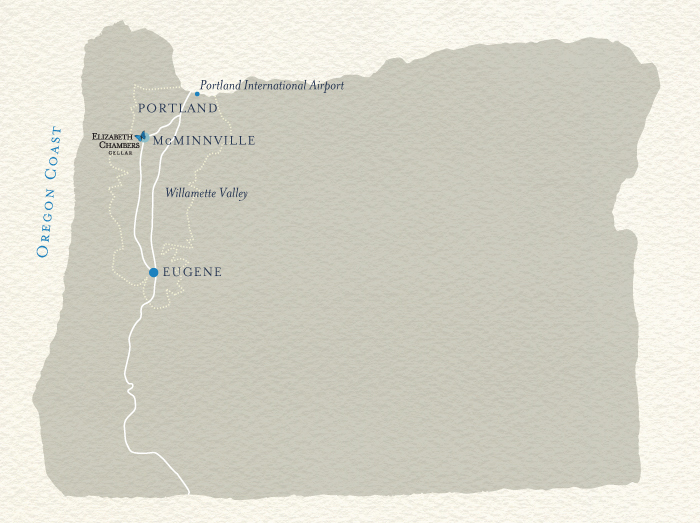 Take the exit for McMinnville and follow for approximately 0.5 miles. Follow I-5 North for approximately 80 miles then take exit 278 toward Aurora/Donald. Continue on Ehlen Rd. NE for 5 miles then continue onto McKay Rd. NE for 3 miles. Turn right onto OR-219 N, and continue to South St. Paul Highway. Turn left on OR-18/99W Bypass toward Dundee. Follow for four miles, then merge right onto 99W.